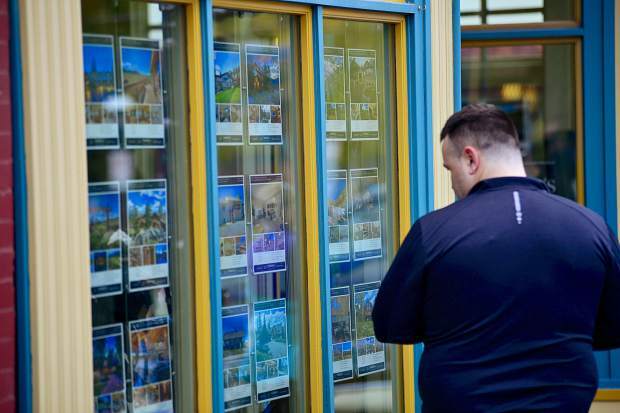 A passerby stops to look at the real estate listings posted in the window of Liv Sothebyâs real estate offices Friday in Breckenridge. The real estate market in Summit County continued to show strength throughout the month of August, posting 265 total sales worth more than $160 million combined, including 37 for $1 million or more. Summit County’s real estate market continued its upward swing throughout the end of summer with the total value of all August sales eclipsing the same month last year by almost 20 percent. The market continues to be defined by record prices, quick closings, an overall lack of inventory and sellers getting near or above their asking prices. Thirty-seven homes sold at or over $1 million, with Breckenridge leading the way and landing four of the top five slots, but there were 25 fewer sales on record at the Summit County Assessor’s Office this August than there were in the same month last year. However, the dollar amount from this year’s sales came in more than $25 million ahead of last August’s volume of $138.5 million. Paula Stanton, a real estate broker with Liv Sotheby’s in Breckenridge, attributed the drop in August’s number of sales to the limited inventory on the market and new construction in 2016 inflating the numbers. The most expensive residence purchased in August, a single-family home at the Cottages at Shock Hill in Breckenridge, went for just over $3 million, compared to the most expensive home traded in August 2016, which sold at $2.3 million. Altogether, Liv Sotheby’s has about 300 real estate agents working for the company, she said, with about 50 based out of the Breckenridge office. At the office, they handle real estate transactions all over the area, Stanton said, but focus primarily on Summit County. Stanton herself has been working in the industry for four decades now, and speaking over the phone Friday, she was fresh off a national real estate convention in Las Vegas. Stanton said she sees strong “continued buyer interest” through what’s generally the strongest time of the year for housing sales — the end of summer — and remains optimistic the blockbuster season will continue to show results with pending summer sales closing in the fall. According to Liv Sotheby’s autumn newsletter, real estate sales typically swell in the spring and summer months, but fall purchases can offer some advantages, both for buyers and sellers. Trends in resort towns can differ, but generally speaking, buyers face less competition in the fall, which can give them better leverage in negotiating over the price. At the same time, sellers find that buyers are often motivated to move quickly on a fall purchase, which often comes as the result of a major life change, according to the local real estate company.